Water ingress detection and hatch cover testing on bulk carriers are two essential procedures for safe operation and husbandry of vessel, cargo and crew. Bentley Strafford-Stephenson from Martek Marine highlights the common causes of water ingress on bulk carriers and the means by which to reduce risks. Ultimately there are three main causes of water ingress; the failure of the metallic structure of the vessel, hatch-cover tightness and the liquefaction of certain bulk cargoes which causes loss of stability. The structural elements of the vessel mean that regular structural surveying and condition monitoring is required but the two most common causes in recent years are hatch cover tightness testing and cargo liquefaction. Bulk cargoes each come with their own unique properties and characteristics which in turn create their own transportation, loading/unloading and stowage issues. The International Maritime Solid Bulk Cargoes Code (IMSBC) dictates the requirement of the shipper to declare to the master of the vessel in writing any information of the particular properties of the cargo to be loaded, a certificate of moisture content and a certificate of Transportable Moisture Limit (TML). Cargo should only be accepted by the master that has actual moisture content less than the TML and not simply rely on the physical appearance of the cargo which may look dry as during transit cargoes could transform from a solid state to a viscous fluid as a result of agitation from engine vibrations, vessel motion and wave impact which compact the cargo. The unique properties of bulk cargoes call for due precaution when transporting. Certain types of coal for example could cause liquefaction due to their moisture content but the most troublesome cargo that has been reported in the last five years is nickel ore. Due to excessive moisture within the commodity liquefaction is a serious risk factor which causes cargo shift and loss of stability. Other commodities that can suffer from the same problem include fluorspar, pyrites, millscale and sinter/pellet feed. Cargo can be further damaged by water ingress as a result from hatch cover leaking. Poor maintenance of hatch covers and coamings or unsecure hatch covers after loading are the two main causes of water ingress as a watertight seal between the rubber packing on the holds and steel compression bars is required. There are several types of testing for hatch cover tightness; visual inspection of the cargo, the traditional chalk or hose tests and ultrasonic testing. Visual inspection simply requires an inspection of the cargo and the inside of the holds to check for any visual water damage and the traditional hose and chalk tests mean that tests can only be carried out when holds are empty. It is only during a voyage that a holds hatch cover’s true tightness can be tested due to the strains presented on a vessel’s structure during transit.You cannot test true accuracy of the tightness and compression. The use of ultrasonic equipment such as Martek’s HatchtiteTM is considered by most surveyors and insurance companies to be the most reliable, accurate and safe method. HatchtiteTM is a portable and lightweight instrument for accurate and reliable cargo hatch cover testing approved by ABS, fully compliant with IACS Unified Requirement U.R.Z17 and approved by insurers and P&I clubs. A transmitter is placed inside the cargo hold (full or empty) which emits ultrasound waves. The hatch cover is closed and a hand held telescopic microphone (which is connected to a receiver along with a set of headphones) is placed at the hatch cover interfaces and the surveyor or operator uses an ultrasonic detector to ‘listen’ from the outside and pick up all ‘leaking’ ultrasonic sounds that leak through the sealing arrangements, vents and cracks. The receiver will display the decibel level of any ultrasound leak and is also heard through the headphones. A water ingress detection system (WIDS) is mandatory on all bulk carriers since 1 July 2004 to monitor water ingress in cargo holds, ballast tanks and dry spaces as per the SOLAS XII Regulation 12, IACS UR S24, IMO performance standard and IACS UI SC180 yet a high number of casualties still occur each year. Old faulty systems need to be replaced with new working systems and it must be checked by authorities that systems have not been turned off during voyage due to false alarms. Now the regulatory compliance window is over, all existing vessels in theory should have WIDS fitted. The majority of Martek’s BulksafeTM customers tend to be new builds with the majority coming from yards in China. When the SOLAS regulations were being created, Martek was a key stakeholder in the drafting of the performance standards with Lloyds Register particularly concerning the performance standard of testing before loading cargo of the WIDS system to ensure it works properly. The company’s WIDS, known as BulksafeTM, works on float switch technology and as such are guaranteed to not cause false alarms. Some of Martek Marine’s competitors use electrodes which are cheaper but are prone to giving false alarms due to the sweating of cargo and the subsequent moisture hitting the sensors. Martek developed its Bulksafe WIDS using intrinsically safe MMS900 float level switches made of Delrin to guarantee the elimination of false alarms and the risk of corrosion for a longer lifetime. The system comprises a central control and alarm panel connected to the MMS900 water level detectors that are installed totally isolated from the cargo and protected from mechanical damage during cargo operations. They can be installed without the need for any structural alterations or piping work within the cargo holds. BulksafeTM is type-approved, very simple to install and is made in such a way that maintenance and testing are possible while carrying cargo. Each MMS900 level switch is totally corrosion proof, protected against dust ingress and carries a lifetime warranty. The BulksafeTM control and alarm panel indicates the alarm status for each named compartment with discrete signals for 0.5m and 2m alarm levels. The system incorporates an optional function to provide a fully automatic ‘in-situ’ functional test of all detectors, even whilst cargo is present in the holds. Included with each MMS900 level switch as standard, is 30m of marine-approved cable for termination to deck/duct keel. The cable is fully bonded to the switch during manufacturing providing a totally immersion proof IP68 protected device even for 25m-high ballast tanks. Sensors relying on sealing of cable terminations during installation, cannot guarantee this protection, and will be prone to failure in service giving potentially disastrous false alarms. Inside each MMS900 level switch is a heavy duty filter to stop cargo debris from clogging up the water level detector and preventing it from working. The filters are made from stable polymer making them corrosion resistant for all bulk cargoes. In addition, the back flushing allowed by the MMS900 water level detectors offers optimum service life. Founded in 2000, Martek Marine provides equipment and services designed to enable the shipping and offshore sector to meet the latest environmental and safety regulatory standards. The company provides world beating systems for BNWAS, engine emissions monitoring, gas detection, water level detection, and cargo tank monitoring. The company also supplies a specialist marine defibrillator. Martek provides an extensive system servicing and system spares service for customers. Martek Marine is headquartered in the UK and has a regional office in Singapore as well as a strong global network of sales and services offices. MacGregor aims to provide safe ships through quality design and hardware, operator friendly systems and good lifetime service In most maritime sectors, seafarers are more likely to be killed or injured performing routine occupational tasks than as a result of their ship sinking. However, significant numbers of bulk carriers continue to be lost at sea, sometimes in a sudden and catastrophic manner. suited to a vessel’s size, design, projected cargoes and operational profile. MacGregor backs up its hatch cover design, manufacture and installation activities with lifetime inspection, maintenance and repair services provided through its global customer service network, supported by an effective supply of original spare parts. maintained for up to twice the life expected from conventional sponge rubber seals, resulting in lower replacement costs and reduced vessel downtime. Securing arrangements and the weather tight integrity of hatch covers must be periodically inspected and tested. High- pressure hose testing can only be carried out with empty holds. Ultrasonic testing does not present a risk of cargo damage, so this restriction does not apply. The strength, integrity and overall effectiveness of a hatch cover, its coaming, sealing system and securing system can be severely compromised as a result of inadequate maintenance or the use of non standard parts. Relevant personnel must be properly trained in operational and maintenance procedures. Macgregor places great emphasis on the safety of personnel operating, and working in the vicinity of its hatch covers and other deck machinery. Some tasks are inherently dangerous, so it is good sense to design equipment that makes it unnecessary for personnel to be in risky situations in the first place. Hatch covers which can be opened and closed without direct manual intervention are a good example. immediately aware of something unexpected happening. Portable control units, connected to the main control stand by a cable, can help to alleviate this problem but the operator’s freedom of movement is restricted by the length of the cable. Coiling the cable and transferring the device to another hatch is time consuming. Full, independent remote control offers the ideal solution. Historically, wireless operation has been seen, perhaps with some justification, as expensive, unreliable and complicated. In the last five years radio remote control technology has become very robust and affordable, so much so that MacGregor now offers a wireless control system that has real safety and commercial advantages. It is available for bulk carriers equipped with MacGregor’s MacRack electric side rolling hatch cover opening and closing systems, and for electrically-driven MacGregor piggy-back hatch covers on bulk carriers and general cargo ships. MacGregor says its wireless solution is easy to implement and allows the operator complete freedom of movement throughout all hatch cover operations. The ability to operate hatch covers more safely, quickly and efficiently are obvious, important benefits. When used to control hydraulic systems, the wireless remote controller reduces the hydraulic power unit (HPU) idling time, as the HPU can be switched off directly from the controller whenever hydraulic pressure is not required; saving power, minimizing noise and reducing system wear. GUARDIANTM anti –piracy barriers are protecting some of the biggest blue chip companies in the world from pirate attacks on offshore drilling rigs, high risk fleets and ships, including CMA-CGM. Whilst most maritime piracy measures focus on trying to remove pirates from ships, GUARDIAN is designed to stop pirates getting on board in the first instance. The first real alternative to razor wire, GUARDIAN works by covering a ship’s safety rails with a specially designed barrier. Once installed, GUARDIAN provides a highly visible, robust and simple way of making access to ship or rig virtually impossible. GUARDIAN is provided by Guardian Maritime Limited, a UK-registered company specializing in the development and installation of vessel protection systems. It is run by husband-and-wife team David and Teresa Stevens, who spent a year developing a solution to the problem of unwanted boarding under sail, at anchor or in port. During installation, GUARDIAN units are tailored to fit around fairleads and unique structures. A single unit or section can be removed or refitted in minutes, for operations such as mooring or vessel maintenance. GUARDIAN can be fitted at sea, offering minimal disruption to day-to-day operation. GUARDIAN is designed with a high level of UV protection, resistant to a wide range of chemicals (acids, alkalis, oils etc), and will remain robust over the temperature range experienced by vessels. Ideally suited to a maritime environment, the units are made from a polymer that does not absorb water and can be swapped between vessels. A BMP 4-compliant installation, GUARDIAN is environmentally friendly, recyclable and saves operating costs by lasting three to five years. It can also be tailored to suit any colour or type of sea going vessel. In product testing, two ex-Royal Marines tried to board a ship protected with GUARDIAN anti-piracy barriers. Following the trial the commandoes concluded it was impossible to breach GUARDIAN’s defensive barrier — despite perfect conditions and assistance given to them. A new development, following customer demand, saw the launch of GUARDIAN Greenwater to deal with the issue of greenwater on-board deck following turbulent weather conditions. This results in two-fold benefits in using GUARDIAN; it not only prevents against unwanted boarding but aids with the issue of green water, which causes untold damage and expense. The first units are due be fitted on- board a tanker imminently. Last year saw Guardian Maritime further expand its worldwide coverage and distribution, firstly signing a deal with SINWA Group, one of Asia Pacific’s leading marine supply and logistics companies, and then with Mares Shipping GmbH, specialists in the supply of spare parts and technical equipment for ships, to become stockists and agents for GUARDIAN. This enables faster response times to both ship fitments and the supply of replacement units by specialist teams of installers — ensuring ship owners and operators great fast and effective customer service. GUARDIAN is currently protecting over 200 vessels which includes tankers, container ships, oil drilling ships and a number of ancillary ships. The combined vessel value protected by GUARDIAN is in excess of $22 billion, with over 4,000 seafarers protected by GUARDIAN on average each day. 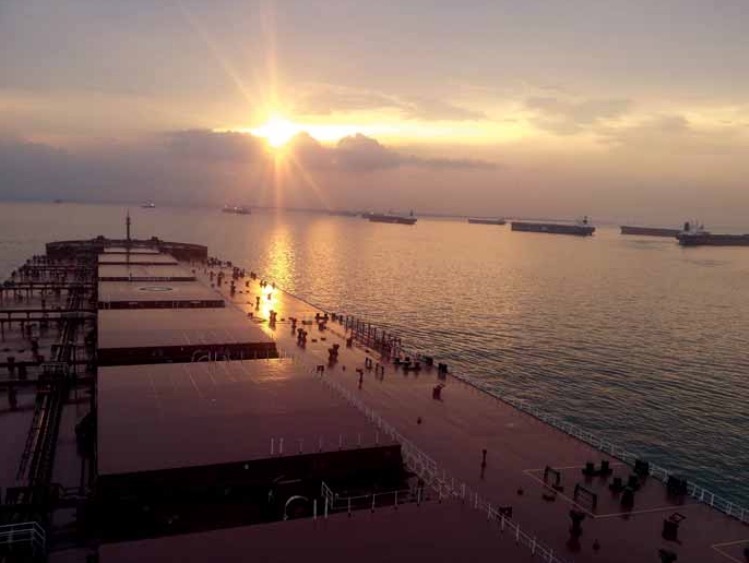 “The dry cargo sector is a vital part of the maritime industry, and ensuring the safe operation of bulk carriers is paramount, writes Mitsuhiko Kidogawa, Operating Officer and General Manager of Hull Department at ClassNK. Bulk carriers account for over one-third of the world’s merchant fleet, the largest portion of any vessel type, and are essential to global trade. The industry recognized our commitment to supporting the safe operation of these vessels, and in addition to being one of the largest classification societies in the world, we also classify more bulk carriers than any other classification society in the world. “With increasing numbers of regulations coming into force over the recent past such as harmonized CSR ]common structural rules], and the mandatory code on noise levels on board ships, the industry has stepped up to improve design standards and offer solutions to tackle these new challenges. However, despite the industry’s great efforts in complying with new regulations, ensuring cargo safety still remains a major issue. Just as ClassNK has worked to help shipyards and operators to address the challenges of new structural design requirements, ClassNK is also working with the industry to ensure safer transportation in the dry cargo industry. “Four years ago a string of catastrophic incidents involving nickel ore cargos shocked the industry. Liquefaction of nickel ore cargoes resulted in the loss of stability, subsequently capsizing these vessels, and costing the lives of 66 seafarers. While cargo-related matters had traditionally fallen outside the realm of ship classification, these tragedies spurred us to find solutions to prevent such losses in the future. The first result of this was the First Edition of our Guidelines for Safe Carriage of Nickel Ore in May 2011.
period. Based on this research ClassNK established the world’s first standards for the stability, hull strength and other requirements necessary for vessels to safely carry nickel ore cargoes in any condition regardless of moisture content. The results of these efforts were published in the Second Edition of the Guidelines for the Safe Carriage of Nickel Ore in February 2012. “The Guidelines include the world’s first requirements for the Specially Constructed Cargo Ship for the carriage of nickel ore in line with the IMSBC code, which were first approved by the Panama Maritime Administration. This was followed by approval from other flag administrations including Liberia, the Marshall Islands and Japan. The world’s first vessel built to the Specially Constructed Cargo Ship requirements, a 27,000dwt open hatch bulk carrier was constructed and designed by Naikai Shipbuilding Corporation to NK-class and delivered on 19 September 2012. “The Guidelines were widely praised by the industry, earning top honors at the Lloyd’s List Awards and Seatrade Awards amongst others, and have been acknowledged as the de-facto standard for transporting nickel ore. While awareness of the dangers associated with transporting these cargoes has helped greatly reduce accidents during transportation, the dry cargo industry is still faced with many challenges. Casualties due to the suspected liquefaction of cargo have occurred with vessels transporting cargoes not categorized as cargoes which may liquefy in the current IMSBC code, drawing concerns that liquefaction may affect more cargoes than previously considered. “Building on our experience examining nickel ore, ClassNK has begun collecting definitive information on these accidents, as well as the properties and behaviour of these cargoes in order to determine their causes. We hope to develop more solutions to prevent any further casualties and ensure the safety of these vessels and their crews,” concludes Mr Kidogawa. other problems with transporting these cargoes came to light. The difficulty of moisture control at stockyards during monsoon season, and the accuracy of moisture content testing for nickel ore cargoes still presented major hazards during transportation. “ClassNK began examining the effects on vessels, in terms of structure and stability, when loaded with nickel ore with moisture content in excess of the transportable moisture limit. We employed extensive testing and numerical simulations on cargo properties and the behaviour of nickel ore with the advice and support of an independent panel of experts over a six month period. Based on this research ClassNK established the world’s first standards for the stability, hull strength and other requirements necessary for vessels to safely carry nickel ore cargoes in any condition regardless of moisture content. The results of these efforts were published in the Second Edition of the Guidelines for the Safe Carriage of Nickel Ore in February 2012. The known issues around bulker safety arise from cargo stability, water ingress and fire hazards. There have been various measures introduced to address these concerns, such as water ingress detection systems, fire detection systems, and advice on better cargo handling/loading. The standard of industry training should also be addressed. Equipment from Servowatch provides an interface to ship alarm, monitoring and control systems in its raw form.The benefit is that Servowatch can centralize data from all the external measurement and detection systems, integrate stability data, and provide reports that can be relayed back to management company offices, or allow for remote access into the system. Servowatch is a global specialist in marine automation and system integration with approaching 40 years experience in this field, having provided bespoke systems using its own purpose- designed state-of-the-art software. Its alarm systems and communication technologies are used on bulk vessels — and others — to improve overall safety. The ultimate safety of the vessel comes down to how the people on board operate in their roles, their levels of expertise and training being paramount. Servowatch’s system is able to provide raw data, undertake pre- defined analysis of data and issue in basic reports, or allow remote access to that data. In the end, it is how that data is used and acted upon which determines the ultimate safe operation. Another consideration is the condition assessment of machinery, maintenance intervals and maintenance work. Servowatch’s system is able to incorporate specialist applications and provide data to support maintenance programmes, from simple machinery repairs to preventative actions. Efficient machinery working in optimum conditions also contribute to overall ship safety in port and at sea. Drawing on its experience, Servowatch has developed a product line named ‘ServoCore’, which has been specifically created to deliver COTS (commercial-off-the-shelf) solutions for all shipping sectors including: bulk carriers, container ships, tankers, passenger ships, offshore support vessels, tugs and salvage vessels, inland waterway and small leisure craft. The standard ServoCore packages are future proofed for the integration of additional components. ServoCore is a real winner for shipbuilders, given the complexity of existing ship automation and integration solutions. It is a fit-and-forget, plug-in-and-play system offering shipbuilders faster installation and shorter lead times, making use of pre- configured system engineering data. The ServoCore Alarm, Monitoring and Control System (AMCS) option is an entry-level system, that offers a reliable and highly cost-effective solution, and is available with three pre- configured Remote Terminal Units (RTU), each with up to 50% expansion capacity. Embedded at the heart of every Servowatch system is the award winning WinMon software package. This dynamic product, developed through generations of applied knowhow, enables state-of-the-art integration and comprehensive system expansion into the bespoke ServoFusionTM package found on more complex and mission focused vessels. Servowatch systems are an integrated part of the ‘world’s most advanced lifeboat’, which is in service with the Royal Netherlands Sea Rescue Institution (KNRM). In November last year, when the KNRM was presented with the prestigious KNVTS Ship of the Year Award for its revolutionary new search and rescue craft, Nh1816, the Institution’s CEO Roemer Boogaard remarked that its development was a “process of true cooperation”. Taking almost five years to develop, Nh 1816, the first in a series of next generation SAR (search-and-rescue) 1906 vessels, was devised in close collaboration with KNRM, Delft University of Technology, De Vries Lentsch Naval Architects, MARIN, Damen Shipyards, Lloyd’s Register and Servowatch Systems — a consortium of renowned ship specialists that has managed to improve on KNRM’s Arie Visser-class; a design that already has a reputation for being one of the best lifeboats in the world. Nh 1816, named after sponsor insurance company De Noordhollandsche van 1816, is a 35 knot self-righting vessel, with an aluminium hull and composite wheelhouse. The hull design, based on Damen’s revolutionary Axe Bow and adapted for lifeboat operation, gives unparalleled sea keeping with a lower resistance (drag) compared to existing craft, resulting in an improved fuel consumption of up to 20%. It was designed specifically to improve high-speed craft operability, comfort and crew safety and, compared to the Arie Visser-class, the SAR 1906 design benefits from substantially reduced G-forces on the hull, resulting in significant noise and vibration reductions. In addition to the Axe Bow, the Nh 1816 is outfitted with retractable fins abaft that can be lowered for increased stability or raised for enhanced manoeuvrability. In the wheelhouse, state-of-the-art fully integrated electronics permit real-time data exchange for ship-to-shore communications. It is in fact the extensive array of Servowatch Systems’ integrated communications technology that has not only placed this vessel in an altogether different league but drove KNRM to sail across a wintery North Sea to Essex in order to bestow an award for excellence on the company’s Head of R&D, Stafford Williams. Williams was honoured for his ‘exception work’ on the new lifeboat and, with his team, was presented with a ‘Statue of the Bronze Rescuer’ for their specialist work on the project. The bronze is a replica of the artwork designed by Charlotte van Pallandt at the request of Noordwijk City Council to mark KNRM’s 150th anniversary in 1976. Retired KNRM Coxswain C van den Berg and his daughter sat for the artist as she designed a monument representing a lifeboat rescuer saving a drowning girl. The bespoke solution aboard the Nh 1816 is built upon a distributed network-based arrangement of computers and data input/output devices designed to assist in the management, operation, control and data recording of a highly advanced SAR vessel. The result is an ergonomically designed wheelhouse of composite construction with true multifunction capabilities, including, navigation radar, ECDIS electronic charting, internal communications, external communications, navigation data, mission logging, alarm, monitoring and control. All bridge components run on a Windows 8 platform, providing the possibility of a future OS upgrade on the same hardware platform and the integrated radar system utilizes the Transas 4000 series broadcasting digitized radar to all connected workstations. A Transas electronic chart system on each work station provides individual operators with full independent charting capability. The integrated navigation sensor package also includes direction finding, GPS, heading, speed, water depth and AIS, whilst the suite of integrated communications system technologies include a capability for multiple wireless headsets, incorporating VHF and MF interfaces. Remote terminal units provide vessel wide alarm, monitoring and control functionality. For added security, the Servowatch scope of supply included an integrated CCTV monitoring and surveillance package capable of broadcasting digitized video to all workstations. Cameras with full pan, tilt and zoom functions can be controlled from workstations without the use of joystick control. All components located outside of the Watertight Electronic Space (WES) have a minimum rating of IP65, except for the LCD and workstation input devices, which are front sealed only, protected by the enclosed wheelhouse arrangement. Anti- condensation and environmental controls monitor and control the ambient temperature of the WES. Servowatch Systems’ co-operation with UK-based Cathelco has resulted in what is claimed to be the most technically advanced new generation ballast water treatment system (BWTS) on the market. Servowatch, has been working closely with Cathelco to develop a fully integrated alarm, monitoring, and process control system for its combination filtration and UV BWTS, a key component of IMO approval and US Coast Guard AMS acceptance. Ellis added: Servowatch Systems unique capability went beyond simply designing a very sophisticated control and monitoring system; it developed a prototype and manufactured the panels. It provided a complete turn-key solution. Based on a combination of advanced filtration and UV technology, the Cathelco BWTS is available with capacities ranging from 34m3/h to 2,400m3/h. Each unit features a space- saving twin UV chamber with only two lamps and is designed for both seawater and fresh water operation. “Together, we have been able to develop a ballast water management system that has no restrictions on the salinities in which ships operate in US waters. It has been approved and accepted to work in marine, brackish and fresh water, allowing vessels to enter the Great Lakes and other inland waterways,” said Ellis. The system received IMO Type Approval and Alternate Management Systems (AMS) acceptance from the US Coast Guard in May and November 2014, respectively. Poor maintenance of hatch-covers, seals and coamings, resulting in water entering a ship’s hold can lead to devastating consequences. Testing that hatch covers are weather-tight is a fundamental requirement for preventing damage to cargo and ensuring the safety of a vessel and its crew. Ultrasonic testing is the preferred method of inspection by P&I Clubs but there are others in use. Chalk powder is applied to the coaming compression bars and panel cross seams, the hatches are then closed and re-opened. The rubber joints are carefully examined. If there are irregularities in the chalk markings then it is assumed that these areas are not weather-tight. This method was the traditional way for testing hold cover compression but does not test the watertight integrity of the hold. IACS states that this test should be followed by a hose test. When a vessel is at sea and is pitching and flexing, seals that were demonstrated to be tight when the ship was stationary might potential leak. A benefit of the ultrasonic method is that the level of compression of a seal can also be detected and monitored through periodic maintenance checks. A higher percentage reading indicates a lower level of compression and could indicate a seal which will leak when the ship is in rough conditions. While ultrasonic hatch-cover testing has been available since the 1980s, Cygnus Hatch Sure has advanced the current technology with fully automatic Open Hatch Calibration (OHC) to set the Open Hatch Value (OHV). This ensures consistent results from hold to hold with a lightweight and extremely powerful 19 × 40Hz element transmitter. This is powerful enough to saturate the largest cargo hold with ultrasound. The variable output transmitter has six selectable power levels allowing the unit to also be used in confined spaces, such as for testing watertight doors. Designed for ease of use and powered by standard rechargeable batteries, the whole system is extremely light and aircraft friendly for passenger cabin transportation. Cygnus Hatch Sure is ABS type approved and the Cygnus product training syllabus has been endorsed by the International Institute of Marine Surveyors (IIMS). Bernhard Schulte Shipmanagement (BSM) is a highly integrated maritime services company and at the top of its game in terms of quality, versatility and fleet size. In an era of extremely high demand for shipping skills, Bernhard Schulte Shipmanagement provides a high-quality concentration of shore and ship-based maritime and engineering expertise. the globe maintains the highest degree of operational and safety integrity over a managed fleet of more than 600 ships. Over 20,000 employees onboard and ashore are at the heart of the company’s success. maintaining ship owners’ assets in peak efficient operating condition, and within agreed budgets; and v protecting its customers’ reputations. BSM is a renowned operator of dry bulk vessels, particularly the largest vessels such as Capesize and VLOCs (very large ore carriers). It has extensive experience and knowledge gained from managing ships for some of the world’s leading dry cargo operators. This is key to safe, reliable and efficient vessel operation and provides an ability to pro-actively anticipate potential hazards and risks, misdeclared cargo loaded on board for example, and take action to avoid and mitigate these. Other actions aimed at optimizing efficiency and performance over the vessel’s life include monitoring of vessel operation to ensure that the engine is being operated in optimum condition, close monitoring of the ballast leg to ensure best possible draught and trim condition, maintenance attention to ballast tanks and coatings and regular hull inspection and cleaning. BSM’s competitive capability also encompasses design optimization and newbuilding supervision to deliver superior safety, operational performance and cost efficiency for owners through consulting, advisory and project management services from the vessel design stage. Major clients include Bernhard Schulte,Vale, MOL, Shoei Kisen Kaisha, Frontline Management, and Seacastle Singapore. Despite a slowing in global new orders, Bureau Veritas’ bulk carrier-classed fleet and newbuilding order book for bulkers both grew during 2014. Growth for Bureau Veritas came from sustained new orders from owners seeking to maximize the cargo capacity of vessels in specific market segments and from substantial transfers of ships in service into BV class. Greek owners led in both areas, closely followed by Japanese and Croatian owners with the bulk of the new orders to be built in Chinese yards. At the year’s end BV’s bulk carrier fleet stood at 1,024 vessels totalling 69m dwt and the newbuilding order book had surged to 150 ships totalling 12m dwt. BV’s market share with Greek owners ordering in China was around 20%. consumption. Clear evidence of this was the series of 15 Newcastlemax 208,000dwt bulkers ordered by Oceanbulk and Cardiff Marine at SWS, China. In the eco-bulker sector Bureau Veritas emerged as a clear leader with 19 Crown 58s, 40 Crown 63s, including ships on order, 34 SDARI Dolphin 64s, nine SDARI Dolphin 82s, two SDARI Green Dolphin 38s and six B Delta 37s either building or delivered. One reason why bulk carrier owners chose Bureau Veritas was because of its good working relationship with the leading Chinese shipyards. These yards value the work which Bureau Veritas has done to smooth the implementation of the Harmonised Common Structural Rules, especially the swift updating of BV’s tools and rules and the swift approval of new compliant designs. They also made good use of BV’s co- operation with HydrOcean on CFD. China’s Hudong and Greece’s Thenamaris both benefitted from CFD optimization studies. Of the 65 new bulkers ordered to BV class during 2014 some standout examples include the 12 208,000dwt vessels ordered by Oceanbulk at SWS, the four 81,600dwt vessels ordered by Japan’s Nisshin Shipping to be built in Jiangsu Hantong, China and the four 39,200dwt Ice Class IA vessels ordered by Jadroplov to be built in 3 Maj Brodogradiliste, Croatia. Croatia’s Atlanska Plovidba ordered two 64,000dwt eco bulkers to be built in Qingshan, China. The year 2014 saw the delivery of 46 new bulkers built to BV class, totalling around 3m dwt. Some examples include two 180,000dwt vessels built for Louis Dreyfus Armateurs at Tianjin Xingang, two 82,000dwt vessels built at Sainty for Singapore’s Raffles Shipping and four 63,800dwt eco-bulkers built for Nisshin Shipping at Jiangsu Hantong.